Six months have passed and I still regularly imagine the hearing the Dr. Murney shuffling his feet down the hallway. We were often the first two to arrive at the clinic in the morning. There was always something comforting about hearing the “Murney Shuffle” as he walked down the hallway. A great symbol of his soft, comforting presence was in the way he walked. On those stressful days, I often long to hear the calming and wise presence that I so closely associated with his walk. In my office, I have a picture of Dr. Murney with a poem I had written for him before leaving Missouri. I remember his response when he read it; he said, “Maybe I have been an Aman Cara.” Now I look to that picture when I feel stuck. I don’t look for answers because I know he would never give them to me anyway. He was not that type of mentor or friend. Rather, he’d help me find my way. His picture still provides some of that same security these days. I often think I know what he’d say. Sometimes it would be a laugh letting me know he related to my situation. Other times it would be that anger showing he is mad about what I am having to go through. Other times it would be that deep concern allowing me to go further into what I was struggling with. But always, he’d help me find the answers in myself. I never went away disappointed for the time spent with him. Dr. Murney always avoided getting caught up in trying to do too much or doing things too quickly. He had great patience in waiting for the right time for the growth to occur. He helped me learn this as a therapist. I’ve learned to value that journey needs to be embarked upon to find the right ending. I have even been able to apply this to my teaching, to a great degree. Lessons learned too quickly are often lessons not learned well. However, I still struggle applying this to myself and to many of the leadership roles which I’ve found myself in. So I’m still learning and often think to his modeling of this to try and attain the patience in myself. Six months and I still often feel the tears well up when I think of him. Six months and he is still part of every conversation with those good friends from Missouri. Six months and I still miss him. But I still feel him caring for me and guiding me. He’s become so much a part of who I’ve become that I think it would be some time before that feeling could go away. We don’t loose people when we live with them as soul mates. They become a part of who we are. We never can loose them because they now are intertwined with our very essence of a person. I see Dr. Murney in the best of me. At times, I’ll see a particular grace in me that I know came from him. My life, today, is very different than the days I used to spend with Dr. Murney. Now I’m in a role where I often am looked to for leadership and mentoring. At times, I feel the discomfort of my age. I wonder if maybe I am too young to be doing the things that I spend much of my day doing. It’s at these times when I frequently remember the words of encouragement and confidence coming from Dr. Murney. When I lead effectively, I know it comes from those mentors ahead of me that cared about me and believed in me. 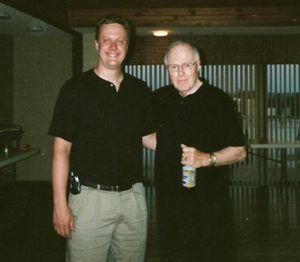 In each success, I still feel the gratitude that is owed to my mentor, Robert J. Murney.